Housed in a 12×16" display. 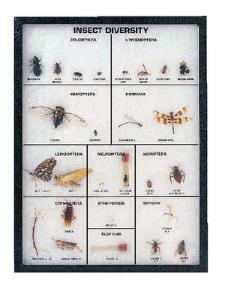 Twenty-seven specimens covering twelve orders of Insecta are represented in this comprehensive collection. From the rugged Beetles to the fragile Neuropterans, this display gives your classroom a great introduction to the variety of insects around us. Delivery information: Included are representatives of the orders coleoptera, hymenoptera, homoptera, odonata, lepidoptera, neuroptera, hemiptera, phasmida, orthoptera, ephemerida, isoptera, and diptera.